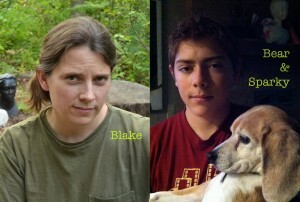 Founders Blake and Bear Ketchum, with Sparky the Beagle. I’m trained as a soil scientist and a web developer, so in order to sell the seed balls, I built Seed-Balls.com, our home on the web, to peddle our goods. People responded to the scientific information and positive message that we put up on the site, and Seed-Balls.com grew wings! The first year, we moved off of couch in front of the TV and expanded operations. Bear manually screened compost by the cubic yard, wheeled it in the (t)rusty red wheelbarrow through our inventory warehouse and testing lab (aka living room) to the production facility (aka sun porch) where I and some eager helpers made seed balls as fast as we could. eCommerce took place in the off hours in the logistics center (aka dining room). Enough was enough. Seed-Balls.com had become a real business. We rented our first manufacturing space in Hollidaysburg, PA in February 2015. Although we no longer watch Star Trek while making seed balls, we do pay attention to a lot of other things. Over the three+ years we’ve been in business, we’ve learned a lot about making seed balls and what makes them grow (or not). We’ve learned how to make seed balls that are round, lightweight, sturdy enough to ship, break down within minutes of a good rainstorm, have a soil chemistry that’s not too strong and not too weak, providing meaningful quantities nutrients but not burning the seeds or tender seedlings. We’ve got the manufacturing process streamlined so that we can offer bulk seed balls and conservation seed pellets at a lower price than any other company. Additionally these years, we’ve reinforced our outreach and educational mission. Every month, we donate seed balls or supplies to schools, conservation organizations, or nature centers. We also add to the information on our website regularly to help educate and connect a broader audience with supportive science-based tips and ideas for conservation gardening. Now, 2016, Seed-Balls.com consists of 4 part time people to make, market, and deliver seed balls, conduct research, and reach out to the world through social media, donations, and local outreach. We make home in a former hardware store in Claysburg, PA. We will continue to get the word out about the importance of native plants though both our business and outreach efforts. Thanks for stopping by, and enjoy browing our website!